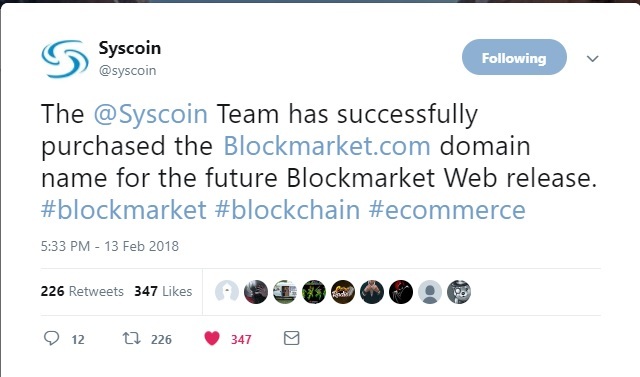 The operators of the cryptocurrency called Syscoin recently announced via Twitter that they’ve acquired the domain name BlockMarket.com. This is a strong blockchain related domain and Syscoin plans to build a fully decentralized marketplace on it that will use its native coin as currency on the e-commerce platform. The purchase was an important step in the Syscoin road map. Now they are ready move off BlockMarket V 1.1, the desktop software which required users to install the platform on a computer and on to a web version where anyone can access and use the marketplace by going to BlockMarket.com. Registered since 2005, BlockMarket.com had been a parked page for the last several years and according to historical whois it appears the seller has a long history with selling premium domains. Surely this was not a cheap purchase, congrats to Syscoin and their team for this smart acquisition. I think this is a strong indicator of the future of Syscoin and the marketplace they will soon launch!